Touring specific frameset for riders wanting to take the path less trodden! Designed to give a sure footed ride wherever you intend going. 3Al 2.5V straight gauge seamless titanium tubeset with some tube manipulation to maximize comfort over any terrain. Fitted with reinforced M6 pannier mounts allowing you to carry loads of upto 35kgs. 3 waterbottle cage mounts allowing you to carry all the liquid you need. 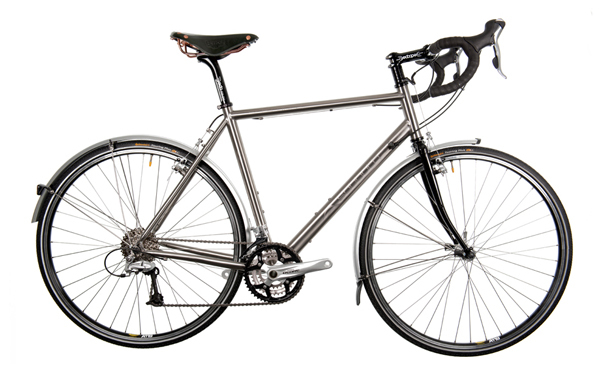 Designed with cantilever brake mounts to ensure maximum control and clearance with even the heaviest of loads. The Silk Route is designed to accommodate upto 38c tyres with mudguards fitted.